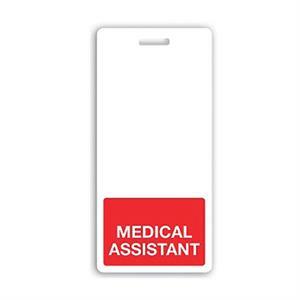 Medical assistants deserve a unique identifier — try this Badge Buddy! Your medical assistants interact with patients as much as anyone on your staff, if not more so. This makes it key to identify your medical assistants, so patients know the role of the person providing care. After all, a patient may not be comfortable disclosing his or her medical history to someone he or she can't identify. Eliminate those concerns by issuing Badge Buddies, like these Badge Buddies for medical assistants. Badge Buddies are durable role-recognition cards that show the wearer's title in bold, sharp text. Surrounded by a color bar, this text allows a patient or visitor to quickly identify their caregiver's job title, lessening anxiety and confusion. This Badge Buddy features a red color bar and white "MEDICAL ASSISTANT" text. It's slotted for easy attachment using a badge reel, lanyard or strap clip, and combines with an existing ID credential to become a powerful healthcare ID solution. For use with CR80/credit card-sized cards, 2.13" x 3.38"